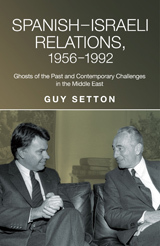 Guy Setton has a PhD in History from Tel Aviv University after majoring in International Relations at the Hebrew University of Jerusalem. He obtained a Master's degree in International History at the London School of Economics. Despite a common heritage dating back centuries and mutual national interests, such as their joint fear of Soviet influence across the Mediterranean, it took 38 years after the establishment of the State of Israel (1948) and a decade after Franco's death (1975) for relations to be established between Jerusalem and Madrid (1986). The absence of ties between both countries prior to 1986 was an anomaly that requires explanation. There was no apparent reason why both countries should not have established full diplomatic ties prior. Indeed, during the first years of Israeli statehood until 1952, Spain sought unsuccessfully to establish official ties with Israel as a means to overcome international isolation. But adhering to a moral foreign policy standard, Israel refused formal ties with the former Axis supporter. By 1953, however, Israel began adopting a more pragmatic view. Five centuries after the expulsion of the Jews from Spain bilateral ties were formalized after Spain's successful transition from Franco's dictatorship to democracy and Madrid's ascension to the EEC in 1986. Once in the Community, Madrid had to align its foreign policy with Brussels which necessitated diplomatic relations with Israel. Without this systematic pressure on Madrid, the anomaly of Israeli–Spanish relations would have likely continued. Post 1986 the ties between the two countries were overshadowed by strong international political forces − the Arab−Israeli conflict and the Israeli−Palestinian struggle − which delayed bilateral progress. Explaining the impact of these forces is key to understanding the relationship. Although many positive milestones have been reached there are substantive issues of concern for both sides, and a feeling that much work remains if the relationship, and indeed friendship, is to become worthy and rewarding. • Understanding the "Opportune Moment"
Tracing the long process of Spain and Israel establishing diplomatic ties in 1986, Setton notes the obstacles of the 1492 expulsion, which left Spain with essentially no Jewish population throughout the modern era, and Spain's alliance with Germany and Italy during World War II. He covers the anomaly of Spanish-Israeli rations, a policy of minimal involvement 1956–63, progressive collaboration 1964–75, the absence of a diplomatic breakthrough 1964–75, regime change in Madrid 1976–82, Spain relations worldwide excluding Jerusalem 1982–86, and normalization of an unremarkable relationship 1986–92.